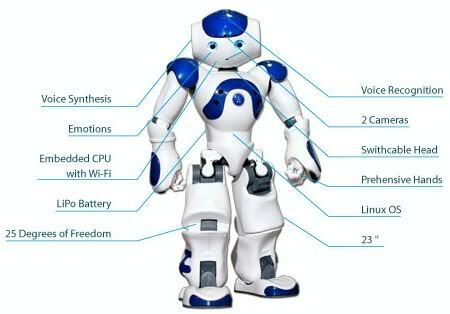 NAO is the most used humanoid robot for research and academic purposes around the globe. Made by Aldebaran Robotics, they have chosen to provide NAO’s technology to any high education program. NAO (pronounced “now”) is fully interactive, fun, statically involving and is the standard platform for teaching robotics to students of all levels.NAO equipped with educational kits, learning from simple visual programming to in depth embedded modules, the versatility of NAO provides the users with a mass amount of programming complexity and experience.NAO H21and H25 has around 58 cm tall, weighs 4.8 kg and has about 90 min of battery with constant walking (including 21 to 25 degrees of freedom). On the inside of NAO is a x86 AMD Geode 500 MHz CPU with built in Linux OS (compatible with Windows and Mac OS). The programming languages are C++, C, Python, Urbi and .Net. There are two CMOS 640×480 cameras for vision on NAO and connects by either Ethernet or WiFi. NAO comes in three different assemblies and price ranges, the NAO T2 $4,160 USD (Ideal for visual and audio interaction), NAO T14 $6,800 USD (Complex movement and prehensile apabilities), NAO H21 & H25 $15,999 USD (fully autonomous humanoid robot). For more information watch videos below.